Incepted in the year 1995, we, “Advance Rubtech (I) Private Limited”, is one of the leading manufacturer and supplier of a complete array of Rubber Rollers and Molded Rubber Parts. Our assortment includes Rubber Roller, Pu Roller, Urethane Coating Roller, Banana Rollers, Industrial Rollers, Silicone Rubber Roller, Aluminum Roll, Aluminum Grooved Roller, Ebonite Roller, Printing Rubber Roller, Flexo Printing Rubber Roller, Gravure Printing Rubber Roller, Lamination Rubber Roller, Impression Rubber Roller, Bow Expander Roller, Hardchrome Plated Roller, Mirror Polish Cooling Roller, Double Jacketed Spiral Cooling Roller, Aluminum Slat Expander, Aluminum Scroll Roller, Embossing Roller and Air Shafts. We flourish all our products at set with industry standards, using the premium quality of raw material, which are sourced from the certified and well-known vendors in the market. Our manufactured rollers are hugely utilized in diverse industries like textile, paper, packaging, printing and plywood. Further to make sure that the offered products are flawless, we are doing a strict check of all the products on several parameters before it is delivered to the clients. We are offering our manufactured products as per the modification required by the client’s demand; we are developed with a modern manufacturing facility that is equipped with the advanced technology and modern machinery. Moreover, we are presenting to our clients excellent service support for fulfilling their necessities and demands. We are flourished with a team of professionals and experts having huge experience in this domain for maintaining amiable relations with the clients by offering the exact products and services as per their needs. We are developed with a team having years of experience behind them, they are being tasked to re-engineer the product line and enhance the image of our rubber rollers in India as well as globally. We endeavor to develop a quality product that meets and exceeds the market needs and demands. With equal contribution our workforce is working with latest productive technologies to make sure that we are ready to deliver what we assure and promise to our clients. Rubber Rollers are a “rubber or an elastic material covering the core made of metal or other materials”. These rubber rollers are often utilized in material handling, assembly, and manufacturing operations. The rubber roller are having high co-efficient of friction with quick return to its original shape when the shape is distorted. The rubber roller prevents damage due to scratching and bumping. These rollers are resistant to chemical substances and protect the roller core and shaft. 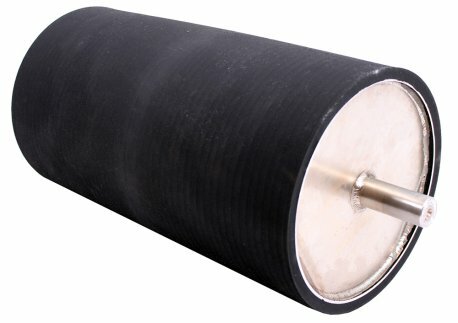 The manufacturing of rubber rollers requires sophisticated technology and experienced people to focus on the performance of the rubber that depends on the formulation of rubber chemicals even though the base polymer is the same. The rollers perform the best when they are properly selected for each application, based on the various conditions and insufficient bonding. Rubber rollers are utilized for variety of purposes and are found in many manufacturing processes. The basic utilize of the rubber rollers are found in the manufacturing processes of textiles, film, sheet, paper and coiled metal. These rubber rollers are covered with rollers that are used in all sorts of container and packaging fabricating equipment as well as machinery used for the sanding and grinding of wood, steel and aluminum. 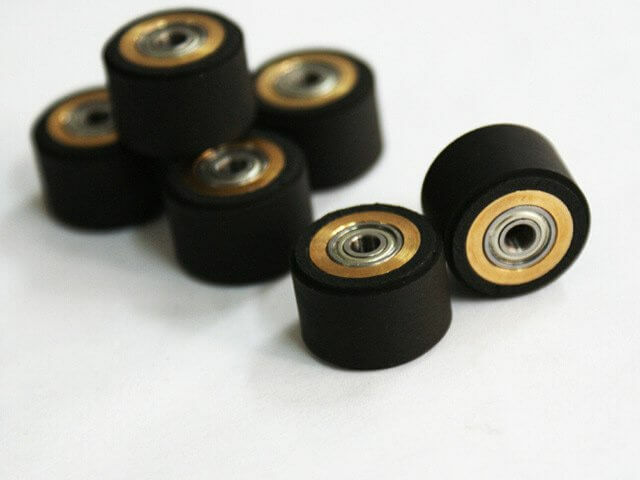 The manufactured rollers are usually in the shape of cylindrical or spherical shape and the devices that are roll or rotate, for example, a small spoke less wheel or like a roller skate or caster. These rubber rollers are widely used in printing. The Rubber rollers are also ideal choice for peripheral decorating of cylindrical shapes and roll-on decorating of large flat or curved surfaces. No run out on finished diameter with reference to bearing size. No damage on side coating.